So here we are in 2012 an ominous year, if you believe the Mayan rumours, with this age of the world all scheduled to come to some grisly end on 21st December. One hundred years ago 1912 also proved to be an ominous year host to two of the greatest disasters in human history both of which have cast a major shadow over all our lives. 12th April 1912 saw the loss of the RMS Titanic, built in Belfast, our home town. Exactly two weeks earlier, on 29th March 1912 and unknown at the time, the last remnant of a group of five men perished in an Antarctic wilderness when Scott, Wilson and Bowers died in a tent from starvation and exhaustion. They were 17 miles short of a life-saving supply depot. Scott was and remains in the pantheon of my childhood heroes, up there with the British Greats such as Nelson and Drake, and like them he died out in the field of action. I well remember reading the little Ladybird book on Scott, watching John Mills in his epic portrayal of the man in the Ealing classic “Scott of Antarctic”. I always hoped the ending would somehow be different, that they would maybe make it to the depot this time, always knowing that their eternal ending is one of doom. Sadly Scott’s reputation has taken a battering in recent times with revisionist histories portraying him as some sort of vain-glorious incompetent, an officer of mediocre abilities, who ultimately led his men to their deaths. The expedition was flawed, selecting motor vehicles, horses, dogs and man-hauling to reach the goal over Amundsen’s single strategy of using just dogs. He also changed plans at the last minute selecting five men for the dash to the pole by including P.O. Taff Evans from the four man support party. The other three (Teddy Evans, William Lashly and Tom Crean) almost perished on their return, Irishman Tom Crean abandoning his two weakened comrades to perform an epic solo march to secure their successful rescue. Taking five men slowed the polar party. They were now cramped; five in a four-man tent living on ration packs design for four. Mealtimes took longer and the great polar killer, malnutrition, began to take its effect. The men were expending fantastic amounts of energy and simply not replacing it. They had budgeted around 4500 calories of food a day; modern analysis shows man-hauling a sledge burns something in the region of 7000 calories a day. Add to this the effects of high altitude on the Antarctic plateau over 10,000 feet and some days the men could each have been expending as much as 11,000 calories! Under such conditions the body begins to eat itself. There were other contributors; Evans, not yet knowing he was in the polar party, had stashed his skis at one of the depots on the way out, which slowed progress. Worse, he had suffered a bad cut from a sledge-runner and not told anyone. The wound refused to heal and he lost condition rapidly becoming the first of the party to die up on the Beardmore Glacier. Scott had reached the Pole on 17th January 1912, only to find that Amundsen had beaten him by five weeks. Amundsen’s sole reason for being on the continent was to claim the South Pole. Leaving Norway in his ship the Fram, he had told everyone he was headed north to the Arctic, only revealing the true destination when he was well out to sea. He pursued his goal with ruthless determination using weaker dogs as feed for the stronger dogs that pulled him to the Pole and back. Scott however was head of a bigger scientific mission and reaching the South Pole was but one of their objectives. He truly led a band of heroes. I already mentioned Tom Crean and his heroic rescue of Evans and Lashly. 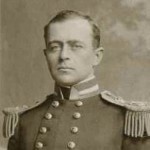 He had been south with both Scott and Shackleton on the 1902 polar attempt and later he would be part of Shackleton’s group when their ship Endurance was lost in the ice. This involved another epic journey hauling one of the ship’s boats to open sea and then sailing to South Georgia, and crossing that island on foot to find rescue at the whaling station there. Then there was the youngster Apsley Cherry-Garrard or plain ‘Cherry’ as he was known. One of the 1912 science missions was to send a party of men out to collect some eggs from the emperor penguin colony at Cape Crozier. There was a current notion to look for a link between birds and dinosaurs and it was thought that penguin eggs might hold the key. The eggs could only be collected in the mid-Antarctic winter, requiring an arduous journey in almost total darkness. With Wilson and Bowers (both of whom died soon after with Scott), Cherry accomplished a round trip of some 120 miles in horrific conditions with the temperature dropping to -60°C. It was so cold that their very teeth split. On arrival they were pinned down by a blizzard and at one point the gale took their tent away. Without it they were doomed and readied themselves for the end. However the wind dropped and miraculously they found the tent caught on some rocks. Later Cherry was part of a scouting party sent out to look for Scott on his return from the Pole. The press got hold of the story and by the time he arrived back in England there was some suggestion that he had abandoned Scott or at least could have gone on that little bit further to effect a successful rescue. It ruined Cherry mentally and he spent the rest of life suffering from depression and anxiety over the polar bereavement and haunting thoughts that maybe he could have done more. In 1922 Cherry published his book “The Worst Journey in the World”. It is an amazing story; one of the greatest adventure-travel books ever written. It ends with the haunting sentence “If you march your Winter Journeys you will have your reward, so long as all you want is a penguin’s egg.” By the time the penguin eggs were delivered to the Natural History Museum the theory they were meant to prove had been discarded. Finally there was the story of five-man ‘Northern Party’ led by Lt.Campbell out for the winter of 1911 at Cape Adare, where they were performing geological work. They were due to be collected by Scott’s expedition ship, the Terra Nova, in February 1912 but the ship was unable to reach them due to heavy pack ice. The group, supplemented their meagre rations with seal meat as they were forced to spend the winter months of 1912 in a snow cave which they excavated on the aptly named Inexpressible Island. Here they suffered horribly from frostbite, hunger, scurvy and dysentery. At one point they killed a seal and were delighted to find 36 undigested fish in its stomach, providing a much needed intake of vitamins. An attempt by those left at Cape Evans, Scott’s base camp, to march out to relieve this party in April 1912 was beaten back by the weather. This Northern Party finally set out for the base camp at the end of September, staggering back into camp on 7th November. The bodies of Scott and his companions were finally discovered by a search party five days later on 12th November 1912. Their bodies were left at this final camp and a high cairn of snow was erected, topped by a roughly fashioned cross. Over the succeeding decades the cairn and tent have been gradually encased in the Ross Ice Shelf as it inches towards the Ross Sea. In 2001 glaciologist Charles R. Bentley estimated that the tent with the bodies was under about 75 feet of ice that had drifted about 30 miles from the point where they died; he further speculated that eventually, in maybe 275 years from now, the bodies would reach the Ross Sea and perhaps float away inside an iceberg. The exhibition is not to be missed for anyone who has felt the slightest stirring from a great adventure story, never mind these epics of human endurance. The actual diaries are there in glass cases with the writing all legible and so very, very moving in their content. They cover tales of the mundane such as life in the camps before setting out through to epic moments such as when Cherry and Wilson relate the tent blowing away at Cape Crozier. There is also one of Scott’s final letters, titled “for my widow”. The South Pole Inn, Anascaul, Co. Kerry – the pub run by Tom Crean after his wandering days were over in the village where he is also buried. ← Years End with a High at Hatfield!